Cash back on everyday spending. The Discover it Cash Back is the flagship of the Discover it cards, with the cash back match at the end of your first year. Its 5% cash back feature is for rotating categories up to $1,500 each quarter after activation. 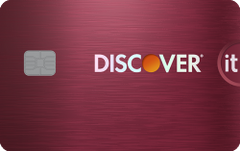 The Discover it Cash Back is one of our picks for the best credit cards of 2019. Our take: The Discover it Cash Back card offers the most value in the first year of membership when it matches all your rewards. Ratings and reviews provided by issuer as of 2018-02-14.